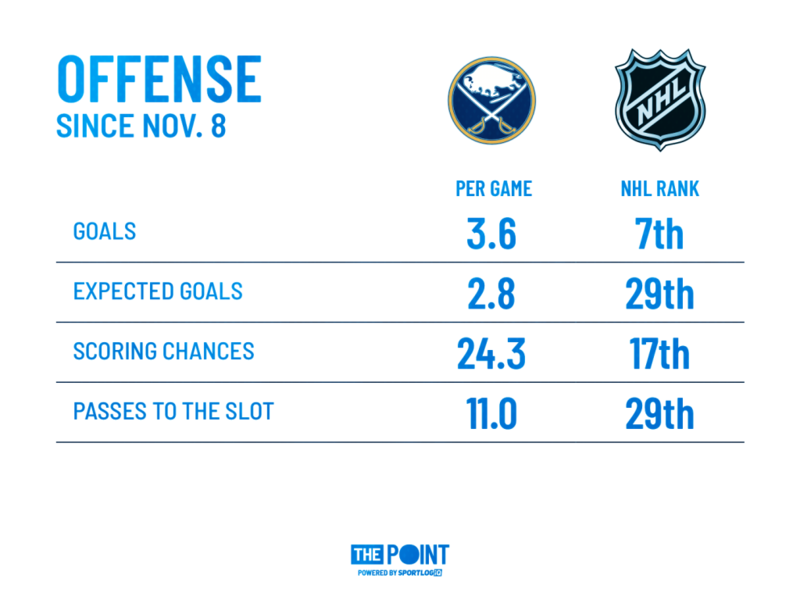 Looking Past the Mirage of Buffalo's 7-Game Win Streak - The Point Data-driven hockey storytelling that gets right to the point. 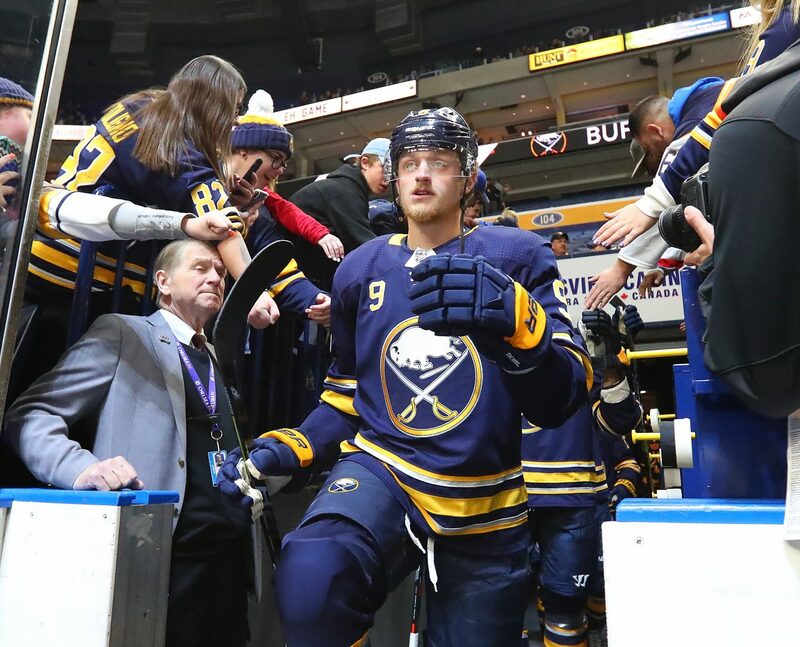 The Buffalo Sabres are currently riding a seven-game win streak, their longest since the 2006-07 season. The streak has also come against some of the league’s premier teams, with wins over the Lightning, Jets, and Wild. Coming off a 25-win season, this is a huge breath of fresh air for the fanbase. There are, however, huge red flags popping up everywhere when looking deeper at the team’s performance. The team’s defense is poor, the offense is overachieving, and the duo of Carter Hutton and Linus Ullmark has been standing on its head. While the Sabres have found the back of the net with ease during the streak, they are not playing a sustainable brand of hockey. They’re in the middle of the pack when looking at scoring chances and bottom three in passes to the slot. My first thought was that they must not have needed to generate as much offense if they were leading early and often. However, Buffalo has actually spent more time tied (166 minutes) and nearly as much time playing from behind (123 minutes) as they have leading their opponents (142 minutes), with four of their seven wins decided in overtime or shootout. The Sabres are exceeding their expected goals total by nearly a full goal per game, which means they’ve scored at a higher rate than the quality and quantity of shots they take indicates they should. In fact, Buffalo’s true shooting percentage (goals/shot attempts) clocks in at 6.1%, which would top last year’s leaderboard by a fair margin, when Washington led the league at 5.3%. Over a longer period of time, teams tend to regress closer to their expected goals total, so Buffalo can’t count on pucks going in as frequently as they have so far without generating more quality opportunities. They do have a lot of talent, Jeff Skinner and Jack Eichel chief among them, to suggest they could generate more quality offense. Now, this is the part that really concerns me. 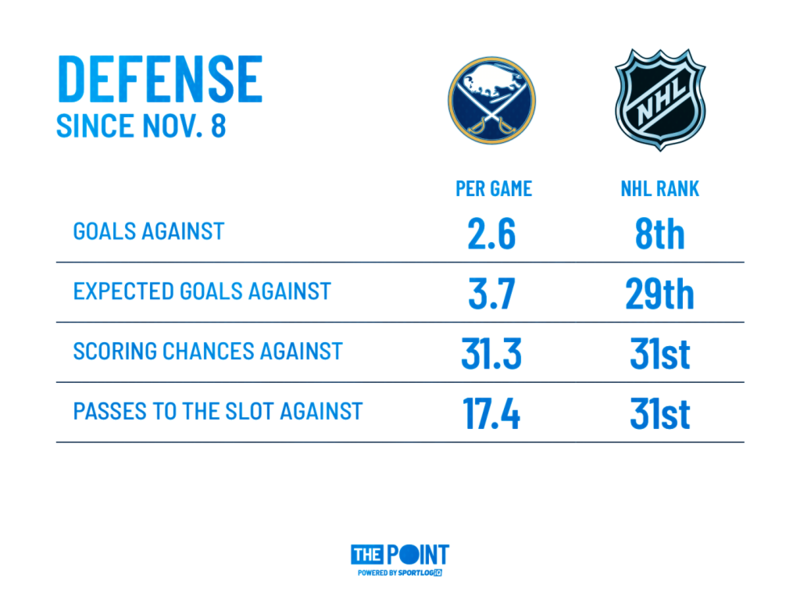 At first glance, it would be easy to suggest that Buffalo’s defense has been good, allowing only 2.6 goals against. However, they’ve been the league’s worst outfit at protecting their slot in the NHL during this streak. They allow more passes to the slot and more scoring chances than anyone else during their winning streak. Winning teams tend to give up more shots as they often play more conservatively and their opponents turn up the aggression to try and mount a comeback, but the Sabres have not played with the lead as much as you’d expect from a team on a seven-game win streak. Top teams also might give up a lot of shots, but they still limit the quality chances they give up. Nashville, for example, is sitting on top of the NHL standings and still rank top 5 in limiting scoring chances against. Just like on offense, they’re massively outperforming their expected goals total with the help of some stellar goaltending. Hutton and Ullmark have combined for the best save % on shots from the slot and the 8th best save % from the inner slot, despite facing the most and 4th-most shots from these areas respectively. Obviously, any team on a seven-game win streak is going to outperform expectations because that’s exactly what a win streak is by definition, a statistical outlier. But the gap between Buffalo’s expected and actual results is too significant to call the Sabres one of the best in the NHL. Now don’t get me wrong, this Buffalo team is better than it was last season and has a very bright future and a talented young core, but they’re not quite in that top tier yet, despite what this massive win streak against quality opponents might have you believe.